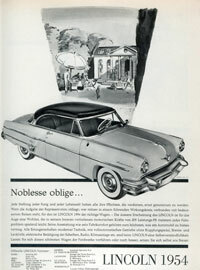 Vieles wurde über Lincolns und Continentals geschrieben. Dieses Kapitel gehört dem Lincoln-Fan oder unserer Besucher! Dieses Kapitel soll eine Sammlung an Presseberichten aus der ganzen Welt werden. Die Sprache ist egal, hauptsächlich die Quelle und Urheberrechte werden angegeben. 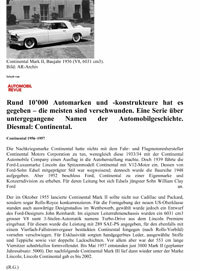 Fahrberichte, Modellauto-Berichte etc sind genauso willkommen wie andere interessante Beiträge. Einsenden per Email in PDF-Format. Adresse siehe unten. There were many words spoken about Lincolns & Continentals in the past few decades.This Chapter covers everything on the "Lincoln & Continental-Theme" that should be archived. There is no limit whatsoever. Everything in connection with Lincoln or Continental can be posted here. Chapters may contain Presskits or even toy cars. We would like to collect as many information as possible. This section belongs to the Lincoln-Fan or our visitors. If you have interesting stories to share or have nice pictures you'd like to see on this presentation, feel free to send your material in. We will publish all sources and respect owner's copyright.